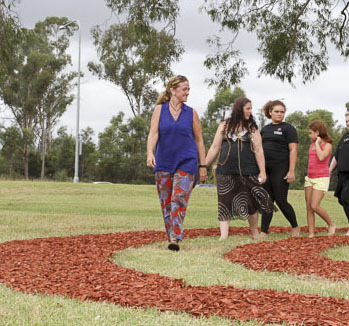 Throughout the C3West project, five artists came together to create temporary public artworks at the Blacktown Native Institution site. Born 1974, Sydney. Lives and works Sydney. Darren Bell’s documentary-style photographs capture the diversity of people and experiences in Western Sydney, often depicting his subjects in domestic or suburban settings. The artist describes his practice as finding beauty in objects, people and places that might otherwise be considered ugly or mundane. By creating an emotional connection with his subjects, Bell seeks to challenge stereotypes of class, race, culture and gender. Bell returned to photography 10 years ago, having abandoned it in high school due to the prohibitive cost of a camera. Since 2010 he has exhibited across Greater Sydney and interstate, including: Temporary Democracies, Campbelltown Arts Centre, 2014; Cold Eels and Distant Thoughts, Tandanya, Adelaide, 2014; Family, DNA Gallery, Sydney, 2013; Place of Sense, Blacktown Arts Centre, 2012; and, A Show of Strength, Boomalli Aboriginal Artist’s Co-operative, Sydney, 2011. He has been a finalist in the Parliament of New South Wales Aboriginal Art Prize three times in 2012, 2013 and 2014. Bell works in Blacktown and has 20 years’ experience in Aboriginal education, training and employment. Born 1967, Sydney. Lives and works Lismore. Karla Dickens is a Wiradjuri artist who engages with politics, history, gender and the environment through her work. Trained as a painter, Dickens’ practice has expanded in recent years to include found objects, either incorporated into paintings or reconfigured as sculpture or installation. Personal experiences of loss, Aboriginality, sexuality and motherhood inform Dickens’ work, which combines Christian and Aboriginal iconography with craft materials and historical objects. Dickens has exhibited in Australia and internationally for more than 20 years. Her artworks are held in a range of private and public collections, including Lismore Regional Art Gallery, University of Technology, Sydney, Campbelltown Arts Centre, and National Museum of Australia. In 2013, Dickens won the Parliament of NSW Aboriginal Art Award, and in 2015 was selected for Asialink’s Kerjasma residency. Recent solo shows include: Field and Game, Ray Hughes Gallery, Sydney, 2012; The Black Madonna, Casula Powerhouse, NSW, 2010; and, Loving Memory, Lismore Regional Gallery, NSW, 2008. Group shows include: Hereby Make Protest, Carriageworks, Sydney, 2014; TarraWarra Biennial, Victoria, 2014; The Native Institute, Blacktown Arts Centre, NSW, 2013; and, Bungaree: The First Australian, Mosman Art Gallery, NSW, 2012/2014. Karla Dickens is represented by Andrew Baker Fine Art Gallery, Brisbane. Steven Russell born 1957, La Perouse, NSW. Lives and works La Perouse. Kristine Stewart born 1976, Nowra, NSW. Lives and works Batemans Bay, NSW. Steven Russell and Kristine Stewart are master weavers who, along with Phyllis Stewart, established Jungah Weavers. ‘Jungah’ is an Aboriginal word for octopus, a recurring motif in the weavers’ work, and also used to refer to the police. 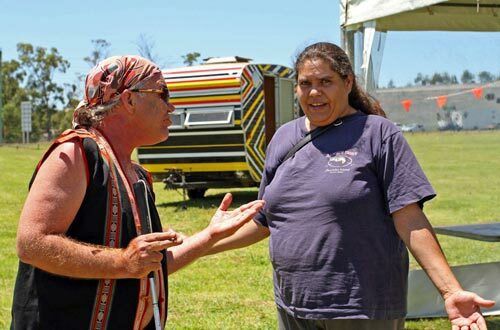 The artists were previously involved with Boolarng Nangamai Aboriginal Art and Culture Studio, during which time they contributed to major projects for the Museum of Sydney and 18th Biennale of Sydney. 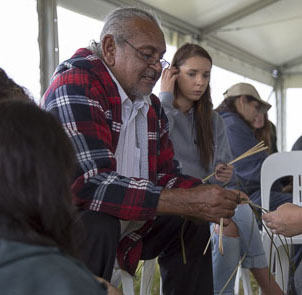 Kristine and Steven lead weaving workshops across Australia, creating sculptural and functional objects from a range of materials using traditional and contemporary techniques. Born 1961, Waratah, NSW. Lives and works Sydney. 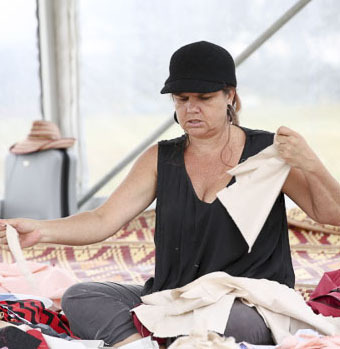 Leanne Tobin is an artist and educator descended from the Boorooberongal and Wumali clans of the Darug, the traditional Aboriginal people of Greater Western Sydney. She works across painting, performance and installation, drawing on Darug stories and shared histories to increase environmental and cultural awareness of the land and its traditional owners. 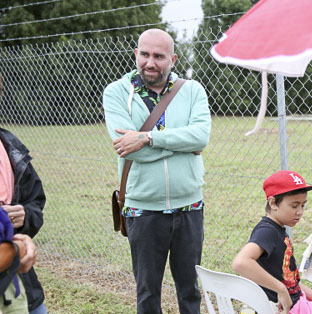 Through her work, Tobin seeks to connect people through their shared role in caring for country, as well as to explore the intrinsic spiritual connection that Aboriginal people have with the land. Tobin has been a finalist in the Parliament of New South Wales Aboriginal Art Prize four times since 2005, winning the award in 2011 with Defending Country, a painting depicting her ancestor and legendary Darug woman Maria Lock. Recent exhibitions include Bungaree’s Farm, Mosman Art Gallery, NSW, 2015; The Native Institute, Blacktown Arts Centre, NSW, 2013; and, Bungaree: The First Australian, Mosman Art Gallery, 2012/2014.